Now that I’ve finished work for the year, I can turn my attention to a favourite activity – reviewing how work went this year! I guess it’s a throwback to my number-loving self (the one that studied maths at university …), but I love delving into the statistics of my business and learning something from it. Similarly to 2017, my income comes from quite a few different activities. Years back, this bothered me, and I tried to focus on just one or two income-generating activities. A couple of years ago, though, I accepted that I’m a classic multipotentialite and even though there might be advantages to narrowing my focus, for me, the disadvantages of getting bored and stuck outweigh that. So bearing that in mind, here’s my pretty pie chart of what income sources made up my 2018 income (which, incidentally, was nearly the same amount as 2017 – a point I’ll return to later …). My various revenue sources during 2018 – because I love pie charts! 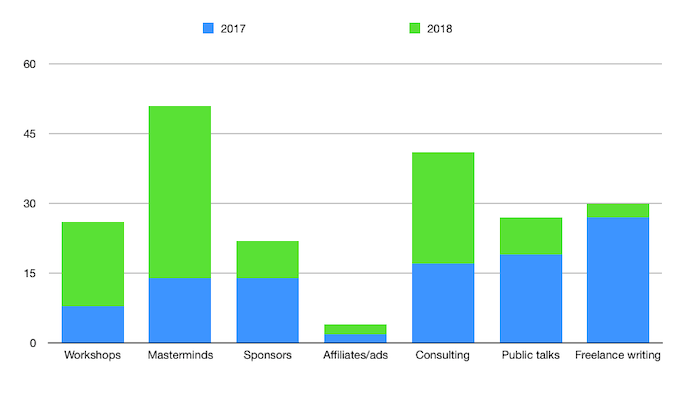 Given that I’ve expanded the number of Mastermind groups I run from two to five this year, it’s understandable that those (plus some private coaching with Mastermind clients) makes up a big chunk of my income. It’s also one of the most fun things I do, so that works well! Workshops this year became exclusively through UWA Extension, and it’s actually been useful from a promotional sense to just be directing people towards workshops in one place. (Plus, I really love the lunch they serve us there … yep I can be bought through my stomach!!). The sponsorship chunk this year is nearly solely from sponsors for The Thoughtful Travel Podcast, a brand new income source for the year, and it’s exciting to be getting a return on that, since I just adore making that podcast. Listener numbers are steadily increasing so I’m hoping to be able to increase the sponsorship rate during 2019, too. Now, if you compare this to the pie chart in my 2017 summary, you’ll see some of these changes clearly shown in blue and green!. 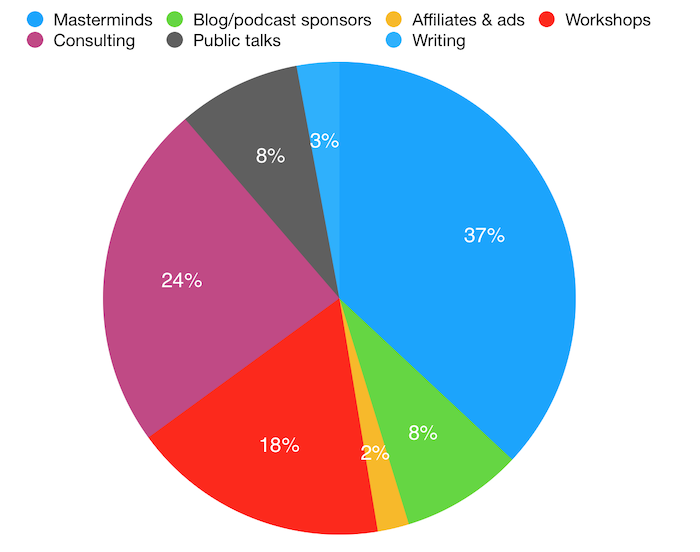 As you can see here, the proportion of my income which comes from masterminds, consulting and workshops grew, and I finished up a big freelance writing contract so didn’t earn so much from that this year. That’s fine by me – right now I much prefer doing more face-to-face stuff than sitting at my desk writing constantly – though a bit is still fun! So, as I mentioned above, the total amount of revenue I had in 2018 is about the same as 2017. It would have been awesome to increase this – I don’t want to be a billionaire, but I would prefer to increase it! – but I think I didn’t due to two factors – trying a bunch of new things (like podcast sponsorship, and less freelance writing), and more particularly, spending a lot of 2018 travelling. I ended up having four separate trips abroad between one and three weeks in length each, only one of which was planned, and although these were awesome, and I can work a little on the road, I certainly can’t work as much as I do at home. I wouldn’t swap those experiences for the world, but it’s worth me bearing in mind for my financial planning! Anyway, all of this rambling to say that for 2019 my word to keep in mind is consolidation. I want to do basically more of the same, just more efficiently, and a bit more of it. I’ve been getting better at systematising my business, and promoting it more effectively too. Having said that, I still plan to launch a brand new podcast at the end of March, but since I already have nearly three years’ experience in podcasting I figure it (just) falls into the “more of the same” category, plus I think it will be even more marketable than my existing one. So how was your 2018, and what do you plan to do the same or differently in 2019? This time of year – especially in Australia, where we have an extended summer break and long, breezy evenings which are perfect for contemplation – is a great moment to take stock of how your work is working for you: and plot ways to make it better! PS: If you want to get a head start on 2019, you might want to consider my online Social Media Summer School!